Meet Ivan, an ex-poundie Staffordshire Bull Terrier in URGENT need of a foster home (with rescue backup) or forever home. He’s not doing well in kennels and needs out asap. Entire. Will be neutered prior to rehoming. Hello my name is Ivan. 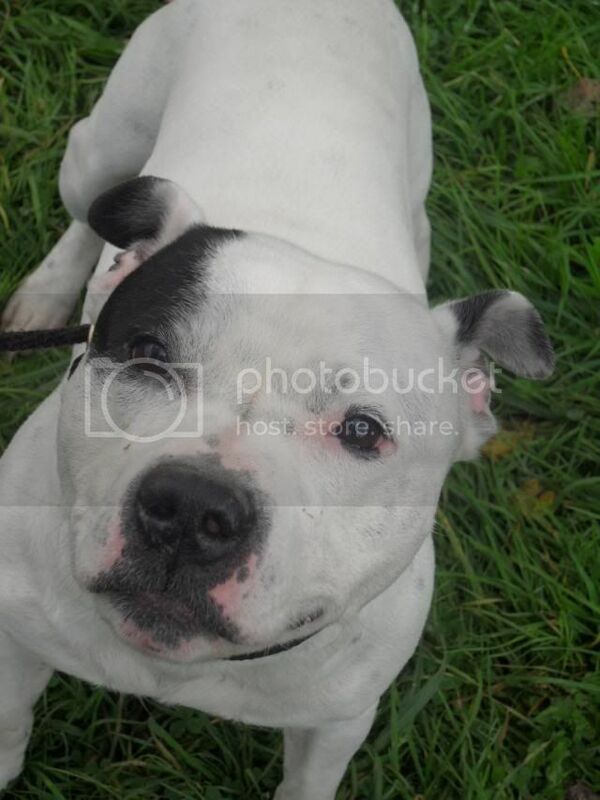 I am a 5 year old white staffordshire bull terrier. I ended up with Helping Hands after finding myself on death row in a dog pound. I don’t understand why noone came to claim me. Apparently I’m a wonderful example of my breed – a typical, active, sociable staffie. I love humans and everyone tells me I’m really great company. I am fine with other dogs when I’m out and about. The staff here say I’m a bit of a ladies man… I have been out on walks with several of the lady dogs at the kennels & quite liked them, so I could possibly live with a female dog. Having said that, I do love getting all the attention, so I’d be just as happy being the only dog in my house. Although it isn’t known if I have lived with children before, I have been very good with the children at the kennels, so I could probably live with dog-savvy children over the age of 8, provided my new owner understands the responsibility involved in having a dog and children. I am a busy young man so I’m looking for an active home where I can get involved in the family’s activities and have lots of stimulation and exercise. I will need at least an hour’s off lead exercise every day in a safe enclosed space. Ideally I would like an owner who is at home most of the day, as I can get a little lonely if I’m on my own for too long. I do have some basic training in place, but I would love to go to training classes so I can brush up on my doggie manners. I have not been cat tested, so it’s not known whether I am safe to live with cats or small furries. Can any rescue help this gorgeous baby boy back on his feet? He is so very miserable in kennels. A good foster home could transform him. Previous Article 6 year old rescue Staffie Chelsea deserves a special home! © 2019 Staffie Support. All rights reserved.